Quiltville's Quips & Snips!! : Galaxy-Gram! Happy Birthday, Quilt Villa! 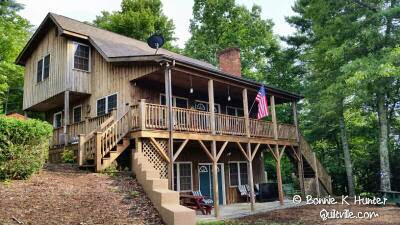 1 year ago we signed the papers and received the keys to my dream cabin, quilt villa. So much has happened over the past year and time has flown so quickly. 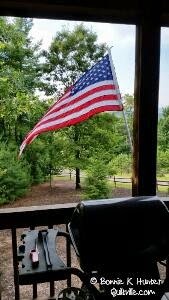 As we enjoy the beautiful view and celebrate Independence Day here in America, I am so grateful for so much. Some things I hold so dear to my heart that I just can't express them in words. I look forward to spending this holiday with family and friends and making more memories that we can reflect on next year at the same time. While I am NOT home to participate, and will be deep into family activities, I know there will be great fun for this online event and you won't want to miss it. so happy for you. Enjoy your time at Quiltvilla with the family and friends. So happy this has worked out for you. You so deserve it. Can't believe it's already been a year! Enjoy your weekend, make lots of memories, and we'll look forward to hearing from you if and when you have a chance! Happy Fourth of July! My how the time passes! May you have lots of fun, relaxation, bonding with friends and family and quilting too while you are there! Bonnie, may you and your family have a wonderful 4th. Enjoy your time at the cabin/quilt villa. Bonnie have a wonderful 4th with your family and friends. Quiltvilla always looks so inviting and relaxing the perfect place to celebrate. I am off to watch last nights quiltcam and sew on a binding. Went to visit neighbors last night so will watch tonight. Happy Fourth of July to all those gathered at Quilt Villa - enjoy your family time together! WOW time has flown by! I hadn't realized it's been a whole year already! Have fun with the family and relax! That year went fast! So happy that you are loving Quilt Villa. It looks so charming. Happy Independence Day to you and yours! Happy Birthday, Quiltvilla!! Love the view from your deck. Enjoy! Have fun, Bonnie. You so deserve it. Thanks again for all you do for us. I'm so glad you have down time/quiltvilla time to recharge your batteries. Hopefully the boys will be able to get there to visit with you while your on vacation. Wow! Time flies when your quilting! Have a great weekend! 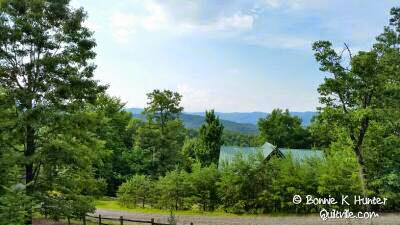 That is really a beautiful cabin my husband and I almost bought a cabin in Maggie Valley 6 years ago. After we got back to California flash floods hit N.C. and the house washed away down the mountain. It is pretty there but it's not California glad we didn't move.